Solitude is located in Utah’s Big Cottonwood canyon a short drive from Salt Lake City, right next to Brighton. In the Salt Lake ski scene it’s often overlooked due to the fact that it doesn’t really have any unique features compared to other nearby resorts. For example, Alta is the snowfall king, Snowbird is the overall steep resort experience, Brighton stays open late into spring and has night skiing, Park City is huge, and Deer Valley is the Rolls Royce experience. So what is Solitude’s niche? When we skied Solitude it was a last-minute add to our normal Park City trip. A big storm was coming in so we left a day early so we wouldn’t have to drive through it. We stayed the night at a hotel near the airport and skied Solitude the next day. They had cheap lift tickets when bought from the local ski shops in Salt Lake, which helped make our decision. The other thing that helped was the 17″ of fresh snow they had received overnight, which was on top of multiple feet in the several days before. That first run down under the Powderhorn chair was something I will always remember. 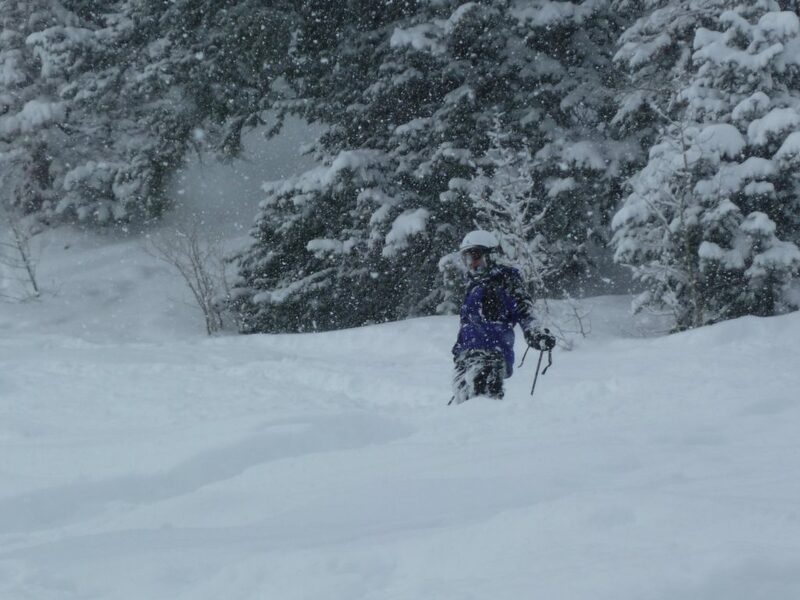 This was some of the lightest snow we have ever skied, and it was boiling up over my head on every turn. People were hooting from the chair. It’s a bit difficult to review a resort when the only day we skied there was one of the best resort powder days ever, but we did ski all of the major chairs and hit all the ski pods so we got a pretty good idea what it would be like on a normal day. I only have 2 pictures from that day due to the heavy snow that was falling. When skiing Solitude the first time, you quickly realize that although the total vertical is just over 2,000 ft., most of the lifts are much shorter than that. 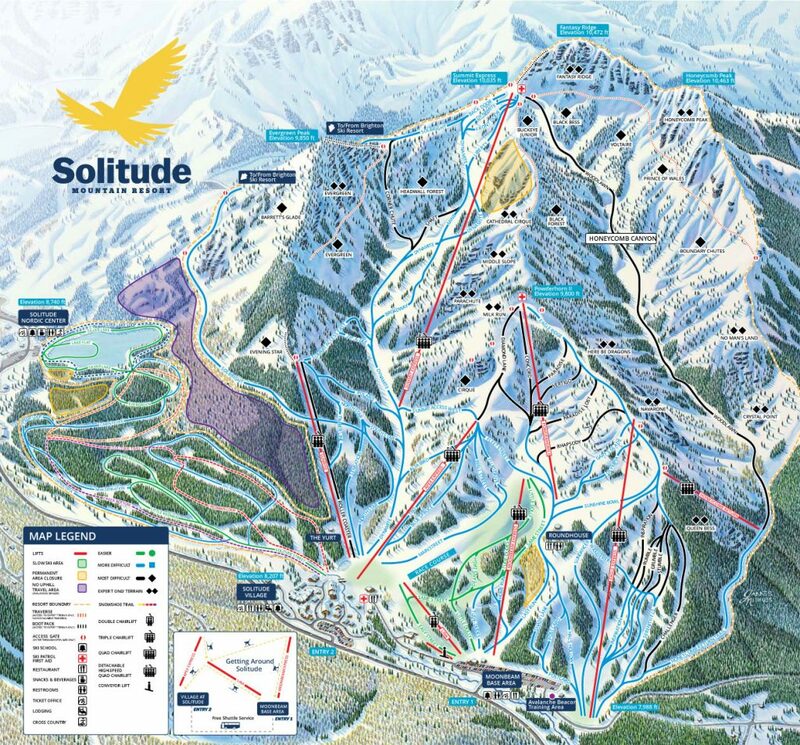 The two lifts with the most vertical are really the only 2 worth spending much time at: Eagle Express and Summit Express. When we were there, Summit was actually a slow double chair, but the alignment hasn’t changed much and it’s the main event at Solitude. These 2 chair have just over 1,300 ft of vertical each, so although decent, they are not very impressive compared with the other nearby resorts. There is plenty of challenge at Solitude with many true double-black runs, but it is famous for Honeycomb canyon which is mellower black terrain. Unfortunately the fall-line runs are fairly short with a long flatish run out on Woodlawn, but it is an interesting zone. It was near the top of Honeycomb canyon that I had a deep snow experience that I will remember forever. I found some untracked snow in the trees and as I dropped off a small knoll I dropped into fresh snow that was over my head. Everything went black for a second as the snow swallowed me whole. People have described this happening but it never happened to me until that time because with today’s fat skis the snow has to be incredibly light. It takes 3 chairs to get back up to the top so these Honeycomb runs will usually be rare unless you want to spend all day sitting on chairs. Solitude base area and on-mountain lodges are pretty basic, which is a bit of a strange contrast with the village that they built. The village is tucked away from the lifts to the east so it isn’t really a good focal point for activity and you may not even get over there because the main focal point of the resort is at the Moonbeam base area. We would like to try Solitude again to get more pictures and experience it on a clear day. We’ve skied most of the Salt Lake area resorts multiple times except for this one and it would be fun to go back. It’s way down the list of great ski areas in Utah, but is worth a visit.